More vegetarian foodventures - Haven't had a chance to explore vegetarian-geared places yet, though given other blogger insights, M Chaya de Cafe & Real Food Daily are pretty high up on the list. However, I was tested with two dinners that I had no control in planning ~ Cheesecake Factory & Black Angus, both proving to be a bit of a challenge to order something meatless & palatable. Thankfully, I got away with their giant tamale corn cakes appetizer at the former, and grudgingly poked away at a soup & salad combo at the latter. This weekend, I am paying a visit to the revamped Violet for another birthday dinner, though their menu seemed to have quite a few delicious animal-free options (heck, I'd be happy just noshing on their Za'tar spiced fries with honey-curry aioli & ketchup). Oodles of fun foodie events coming up - What perfect timing for me to go veggie, eh? But for you omnivores/carnivores, there are quite a few delightful foodventures for you to explore . 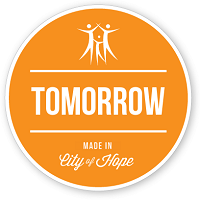 . .
1) CITY Night @ Ciudad, tonight - Too Hot Tamale's Mary Sue Milliken and Susan Feniger are bringing back the global menu from their former restaurant CITY for Leap Day at their downtown Ciudad. Let your tastebuds travel the globe in one night with foods from Thai pork dumplings and noodles to a traditional Greek moussaka, and save room afterwards for their caramel walnut tart. A menu of tonight's offerings here. 2) Friday Night Flights @ Campanile - Ok, it's a recurring weekly event - but tonight's 3-course small-plate, wine-paired meal looked particularly sumptuous, especially the "Margaux" flight with three Bordeaux sub-region wines paired with rich & hearty wild mushroom arancini, seared foie gras, and buttered noodles with bacon and parmesan cheese. Other menus offered tonight include a light, refreshing seafood "Tropicana" flight and a "Riesling" set merging the floral white wines with Central European cuisines. Not bad for $38/person. 3) Margarita Tasting Menu @ Border Grill Santa Monica on March 6 - co-sponsored with Tequila Corralejo, the dinner features a fairly diverse Latin-fusion menu, with courses such as scallop and grapefuit ceviche and seared rainbow trout with curried veggies served up with creative variations of the traditional south-of-the-border drink - think chai margarita with cardamom infused honey, a meyer lemon meringue margarita that's "shaken until light and fluffy" and a whimsical tequila milkshake duo. Full menu here. 4) Farmer's Market Dinner at Auntie Em's Kitchen on March 11 and 12 - you may know them from their hearty breakfasts or their red velvet cakes, but by popular demand they're bringing back their Farmer's Market dinner for two nights, with a wicked menu created around in-season produce available at the farmer's market. Offerings include braised beef ribs with creme fraiche mashed potatoes and a Moroccan lamb stew with garbanzo beans, baby carrots and baby turnips. And with their vegetarian wild mushroom lasagna with white sauce offering, this is an event I can actually attend! Full information here and call/email quick to get your rezzie down! And much thanks to Pat from Eating L.A. for the heads up! 5) Eat, Drink & Be Merry Three-Course Prix-Fixe @ Napa Valley Grille during March - following the success of their participation in DineLA, which I had the pleasure of tasting, the Westwood restaurant is doing a $39 prix-fixe, and an additional $12 for wine pairing, till the end of March. I'm guessing the offerings will be switched up since their newsletter asked interested patrons to call for further details on the menu, but there will always be a choice between two options for apps, mains & sweets. And $51 for three dishes & wine is definitely a substantial discount from their regular prices. Here's to good eatins' to all of you! Not white Sangria, but a Zen-gria. Vote for my Mac 'n Cheese: Chow.com is running a Macaroni and Cheese recipe contest, so I put up my Adolescent, Half-Baked Mac 'n Cheese recipe up there. While I'm wary of a contest where one of the top contender is a monstrosity involving packaged mac 'n cheese and hot pockets, I'll keep my fingers crossed that mine will get featured. Who knows, maybe the Food Network may spot it and offer me a show! Or not. My Vegetarian Life: So far, so good on staying meatless -- dairy products and meat substitutes do a decent job of replacing dead animals (expect a review of vegetarian meats soon). No amazing recipes yet (my workweek meal routine consisting primarily of the three Ss - sandwiches, soups and salads) but dining out is less constraining than I thought it would be, though that could be me avoiding particularly meaty places (Korean BBQs, steakhouses). Particularly worth mentioning is a Doughboys lunch I had last Sunday, where I got a wonderful Caprese sandwich: creamy buffalo mozzarella slices with spinach and juicy tomatoes with olive oil, balsamic vinegar and pesto in a crispy and tender baguette, with a tangy cole slaw on the side! Heavenly . . . But I have a few caveats to this -- I'm not going to be super scrutinizing of ingredients & labels, and will likely still be consuming things that aren't obviously meaty but contain meat elements (e.g. 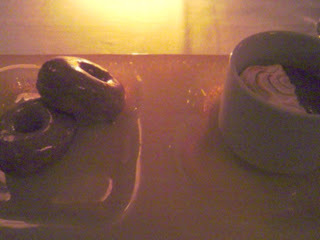 marshmallows and panna cotta with meat-derived gelatin and my omega-3s which probably came from fish). And, since I'm not observing Lent Eastern Orthodox style, Sundays will be a mini-break for me and if I really want meat, I'll get it. 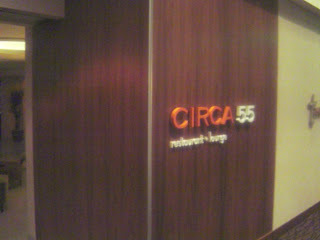 Oh yea, there's also my one little non-Sunday break to eat at Circa 55. Did I mention I'm not really religious? So expect my foodventures in the next several weeks to highlight some veggie restaurants (or great veggie dishes in regular restaurants). It's been over one week and while I don't really miss meat, I've noticed how big, and probably unhealthy, a role it played in my usual diet. So maybe by the end of this experience I'll be either 1) Michael Pollan/Marion Nestle - like and be more conscious / aware of my food choices or 2) batsh*t insane. Take your pick. That being said, soups are one of my favorite dishes that's easily be made vegetarian friendly. But one of my big gripes with pre-made vegetarian soups is that 1) they are either a watery vegetable puree with no chunky textures, 2) just a oversalted tomato broth with nasty tasteless veggies thrown in and 3) of course, playing it safe with the flavors for broad audience appeal. And as much as I like making soups from scratch, often I don't have the time (and I'm too big a worrywort to just let something simmer in the kitchen for however long) So I decided to take the best pre-made and fresh to make a quick, simple and satisfying soup. I simply sliced up about a cup of bell peppers & mushrooms and roasted them in the oven for 10-15 minutes at 375, meanwhile, I thoroughly simmer 2 cups of those organic puree-ish soups from a carton (cream of sweet corn for this particular one) and add the vegetables at the end, top it all off pinches of ground ginger, cayenne & black pepper, a teaspoon of white truffle oil and a handful of mixed greens. And the generous, filling bowl of soup clocks in at a very figure-friendly 350 calories. Yes, very S. Lee or R. Ray- but at least nothing is ladened with preservatives, artificial somethings and goodness-knows-what. P.S. 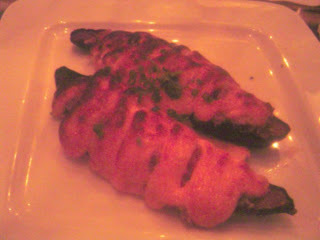 Got any great vegetarian recipes or wonderful spots to check out in L.A./O.C.? Let me know! 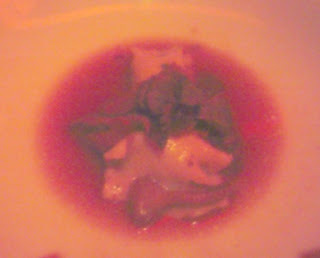 I've been hesitant to post about my DineLA dinner @ Napa Valley Grille since my digi-cam (more specifically, my memory stick) went on the fritz and thus, the bulk of pictures went into the graveyard of 0s and 1s. 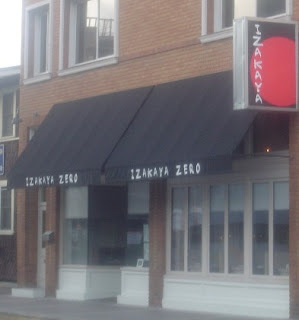 However, the dinner I had here was pretty good overall, and this restaurant hasn't been getting much love as of late, so a (mostly) pic-less write-up I will post. Napa Valley Grille is a small chain (six locations, including one, appropriately enough, in Napa Valley) specializing in Californian cuisines, and of course, lots of Californian wines with a decent by the glass list. Their Restaurant Week menu looked pretty interesting so I decided to check them out, having remembered having a decent meal there about a year back. The prix-fixe deal was made even sweeter by my discovery that by signing up for their email club, I get a coupon for a complementary flight of wine. Nice! Given what I'll be eating that night, I chose a set of medium-bodied California reds that were pretty bright on the fruit notes and kind of soft on the tannins. The bread basket here was somewhat interesting and served with olive oil/balsamic and a dip that tasted midway between tapenade & hummus, but we were saving our appetites so we only nibbled a little bit while waiting for our first courses. To start, I got the house-made pappardelle pasta in a brown butter nage with winter squash & artichokes - more complex than I anticipated but the flavors blended very harmoniously, the mildly sweet & savory combo from the veggies, nutty-toastiness from the brown butter, and wheaty goodness of the al dente pasta. My dining companion thought the pan-roasted sea scallops with hummus, brussel sprouts and mushroom salad was less successful, particularly because the scallops were too salty. I had a bite and didn't think it was oversalted in general, but could see how eating the seared exterior would result in a sodium overload. The accompaniments to this dish, however, were pretty nondescript. For main course, we both went with the prime aged sirloin filet with sweet garlic cream, butterball potatoes and caramelized salsify. 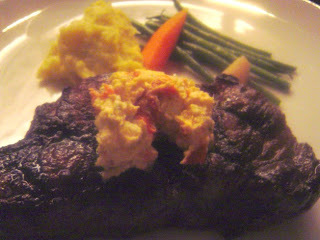 Overall it was solidly delicious, the steak, about 8 ounces worth, was succulent & rich with beefy flavors. 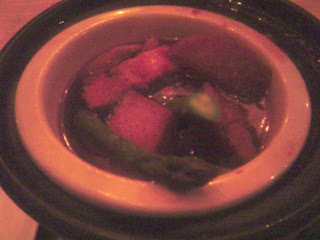 The potatoes were fluffy & buttery without being too heavy, and the veggies tender but not mushy. As tasty as everything was, nothing really stood out - it basically felt like a higher-quality, but standard, steak and potatoes meal. Maybe the restaurant was intentionally playing it safe for broad appeal, maybe it was just poorly executed that one night. I can only shrug. 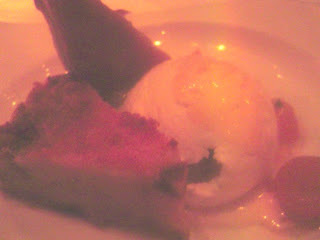 For dessert, I got the blood orange bread pudding with white chocolate ice cream and kumquat confit . . . wow! A warm, gooey baked creamsicle like concoction with a marvelous balance of the creamy richness and fruity tang. The kumquats were exceptional too (i.e. not too bitter). My DC agreed that it was quite delish. My companion got the chocolate sampler which included a chocolate pudding tart, a chocolate creme brulee, brownie topped with chocolate ice cream & a mini-mug of hot chocolate. We both agreed it was a hit and miss. The tart tasted generic bleh (the pudding could've came out of a Jell-O mix, as far our tastebuds are concerned) and the brulee was soupy and had an unappealing bitter-tart aftertaste. The hot chocolate and the mini ice cream-brownie sundae fared much better. Like almost all my other DineLA meals, I was neither overly impressed nor thoroughly disappointed by the mixed bag of offerings. But I'll probably swing by again if I'm in the Westwood area and in the mood for a meal with wine and without the usual college crowd. The very last of my DineLA dinners (literally, this took place on the last day of Restaurant Week) and it was a cool occasion to 1) meet up with the bloggers from What's to Eat LA and 2) check out the new Trader Vic's lounge right next door at the Beverly Hilton. After a tropical libation at swankier Trader Vic's lounge (and the cocktails are still as deceptively potent as I remembered from its old location), we met up and proceed to grab our seats at Circa 55, the somewhat upscale and stylish-looking Californian-Fusion restaurant in the hotel. Being a restaurant in a hotel, I'm immediately suspicious of the food, since they typically cater to the tourist/business conference crowds that are too lazy and/or not picky enough to look around for food - but the menu (both the regular one & the DineLA prix-fixe) was interesting enough for me to get over the initial skepticism. And hey, it *is* Beverly Hills, surely the tourists & meeting-goers have more discerning palates. 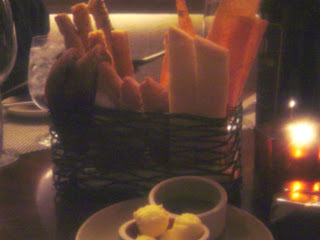 Indeed, they made a great first impression with their sophisticated bread basket (served with butter balls & olive oil), and I *rarely* get impressed enough with the pre-meal baked carbs to take photos of them. which was delicious: oodles of sweet, succulent crab meat that's pan-fried to near perfection and kicked up a notch with the wonderful mustard sauce. 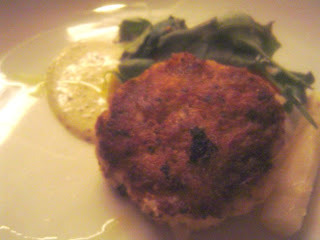 The vegetables accompanying the crab cake were also very fresh-tasting. A generously portioned, juicy and full-flavored slice of meat - I didn't pick up much of the fruity soy marinade, but it went very well with the slightly tangy blue cheese topping. The accompanying starches and veggies weren't bad either. I had a forkful and it's a nice flaky filet of fish. 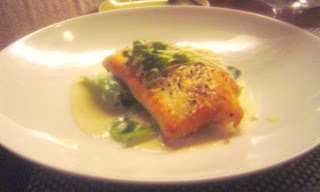 Again, I didn't pick up much of the sauce but felt the halibut is fine on its own with the crispity, aromatic herb crust. 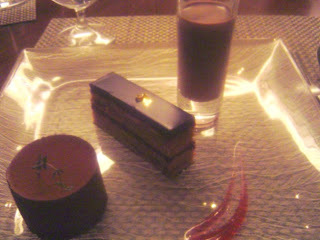 which contained a classic Opera Cake, a Chocolate-Thyme Mousse Cake and Chocolate Soup in a shotglass. 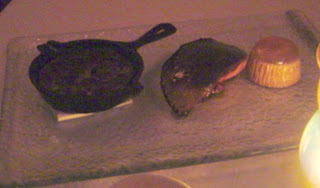 All of them were delightful in their own right, from the familiar chocolatey creamyness of the Opera, the eccentric cocoa-herb combo of the mousse cake (very interesting, but not sure if I would order it on its own) and the soup which my companion very accurately described as "liquid chocolate churro". 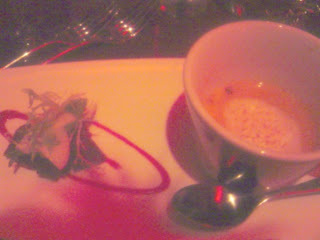 which looked pretty, but wound up being a bit too tart and a bit too soupy for his preferences. Oh well, live and learn. So in short, Circa 55 is pretty good (and certainly way better than my initial expectations). Given its location and its price range (around $50-60 a person sans drinks), it's probably a place I'll save for special occasions or if I'm in the Beverly Hills area. But its DineLA dinner, which saved us $25-30 compared to the regular prices, was quite a bargain -- so it's definitely on my check out list if they're participating next year. Tea Festival in Venice: For tea-o-philes or folks looking for something to do in the Venice area, the Kulov's 8th Annual Valentine's Tea Festival will be taking place at the Electric Lodge in Venice tomorrow 3-8 p.m., with a focus on Chinese teas. There will be tea tastings, dim sum samplings and various performances. $10 advance, $15 at the door (children under 12 go for free) - for more information, go to kulovteafest.com. Chinese New Year's: Gong Hay Fat Choy, everyone! Having already dim summed recently, and not feeling particularly ducky, I think this year will be pretty low-key in the way of celebratory Chinese grub; bring on the century egg juk and xiaolongbao dumplings! 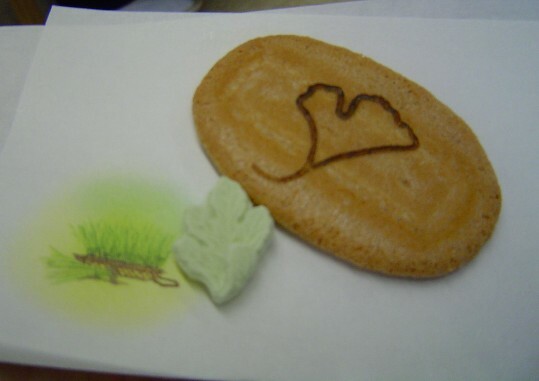 Okay, maybe I'll indulge in a little nian gao. But happy Year of the Rat, y'all! 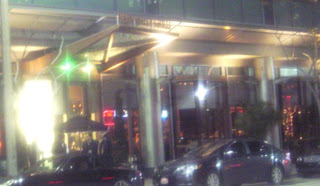 DineLA Wrap Up: Ok, it came and now it's gone. From my own personal experiences and what I've been reading on the boards & blogs, it seems like the inaugural Restaurant Week was a success in getting people to check out new restaurants that they otherwise wouldn't. The meals themselves? Well, that seems to be a mixed bag, with even better-known restaurants like Grace floundering a bit. But if they polish up their game next year and throw more interesting restaurants in the mix, I would partake in this again. And of course, hoping that they don't recycle their prix-fixe menus like the S. Pellegrino Dine-Out in September. The Whisper Lounge recently brought Anthony Jacquet (from the Restaurant at the Getty Museum) to head its kitchen and design the menu, so their PR agency held an event for us food bloggers & writers to check out its new offerings for free. Since it was a nice opportunity to taste their new dishes and to meet fellow blogger Caroline, I went for it with pretty much a blank slate mindset; I was aware of the mixed reviews (with general advice of going for drinks and small bites) but who knows, maybe a new chef and a new culinary direction is all it needs. 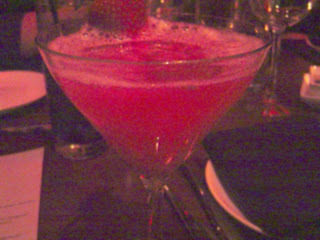 Strawberry Ginger Martini with Ketel One vodka and it turned out well. It was fruity, but well balanced with the spicy ginger and the vodka so didn't wound up tasting like spiked syrup or jello shots. An amuse of Albacore Tuna Tartare with Radish Salad, Sesame Crisp and Citrus-Ginger Dressing, which was nice but nothing mind-blowing since it's not unique enough to differentiate itself from all the other raw/seared rare tuna dishes out there. It's not bad, and actually quite good for what it is, but I was hoping for something a little more edgy to start. "Soup and Salad" - Butternut Squash Soup with Bacon and Apple Foam; Heirloom Beet Salad with Empire Apples and Blue Cheese Vinaigrette now this is a starter course I can get excited about; both the soup and the salad were not only delicious, but had elements of "that little something extra" - the apple foam and the savory bacon were nice complements to the soup, and the tangy, pungent vinaigrette contrasted beautifully with the subtly sweet beet-apple combo. Homemade herb-ricotta agnolotti with wild mushrooms in truffle broth - who can hate stuffed pasta that ends up being a warm molten cheese explosion in the mouth? I think the technical term for this is "plain yummy" but if you want specifics, I not only appreciate the tasty pasta but also the broth for not being over-the-top with truffle flavors. I definitely do enjoy that aroma but it's often used too liberally, which makes me wonder 1) whether it's the real truffle or just man-made "truffle flavoring" and 2) what is the kitchen trying to cover up. Fortunately that's not the case here, so I can still enjoy the nuances of the pasta, filling & the other fungi on the plate. 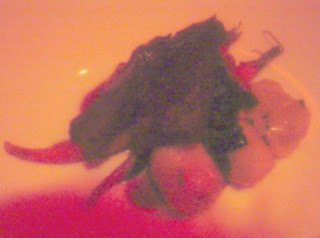 Diver Scallop with Forbidden Rice, Baby Carrot in Blood Orange Vinagrette When it first came out a few of the fellow diners and I thought the black stuff may be caviar ("Wow? So much?!") but after a brief moment's pause & closer observation, we realized it was the forbidden rice. As with the tuna amuse, this dish was very good with the fluffy rice, the perfectly seared scallop and the tart-sweet sauce, but was just shy of that little oompf to make it memorable. Braised Beef Short Ribs with Parmesan Gnocchi, Caramelized Vegetables and Jus I have weakness for gnocchi, and these were simply divine! Light and fluffy and flavorful, I only wished there were more of them! As for the short ribs, they were good but I expected something a little more meltingly tender (though a few of the dining companions liked that this braised meat had actual texture & substance and not mooshy). Then again, I'm personally a sucker for meats braised to the point of falling apart with just a fork -- so could be just me. 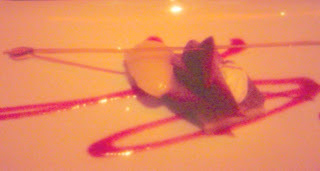 Finishing it all off, Zinfandel Poached Pear with Almond Tart, Cranberry-Champagne Coulis and Pear Gelato that I think was very nice because it was so well balanced in flavors and a great mix of textures. The pear wasn't poached to a mush, and the almond tart was just aromatic enough to complement the fruit & gelato w/o being overpowering (tricky to do with pears). So what do I think after all is said, done and eaten? Well, for starters, it surpassed my expectations. Everything I had was good (or better) but of course, that came with a caveat that this was a specially pepared tasting menu that we were eating gratis and with the staff knowing that we're a bunch of writers & bloggers. And unfortunately, some of the items sampled here are not offered as part of their regular menu ~ major bummer for me since I would've definitely returned for the soup and the gnocchi! Price-wise, I think it's a little steep, so I second others' recommendations to come for drinks & small bites - at least for first timers who aren't quite sure (you can always wound up staying for the meal if you like, and if you don't, check out some nearby places such as Celadon, Du-Pars or any of the casual eateries in Farmer's Market). But if their overall menu are as delicious as what I've had here, it's definitely worth considering going here for a more upscale meal and its speakeasy environs and tucked away location in the otherwise noisy & bustling Grove certainly makes it a better option for a classy date. However, for now, it's a bit early to make a final call - but I do hope that Chef Jacquet's breath of fresh air & innovativeness carries through to make this place successful in eats and drinks. And I certainly won't mind returning and giving this place another evaluation, and actually footing the bill. The starlet of the DineLA set, of course I had to check out what Grace to offer and thanks to my serendipitious checking of OpenTable (well after everyone pointed out that they're fully booked and I got stuck on a double-digit waitlist) I managed to score a table for me and my friend last week. So off we went to see what Neal Fraser whipped up for Restaurant Week . . .
. . . and that was a lot of choices, if you're willing to pay the price. On top of the standard DineLA $34 dinner offerings they also had numerous upgrades available for supplements of various prices. 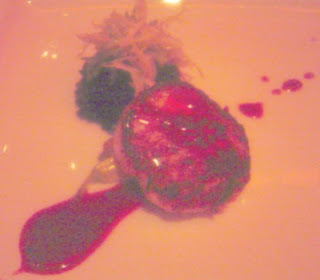 Want to try the foie gras appetizer? Sure, add $16; or maybe the wild boar entree? $14 more and you got it. How about a wine pairing for an extra $30? But all those extras miffed me a little. True, they are fully disclosing the additional charges and the diner still have choices on the standard option, but it's still got to me that they're getting you in the door with a $34 menu, only to besiege you with 6-8 upgrades that can easily double the price of the prix-fixe. But for diners who can stick to their guns and not get tempted (and boy were all those extras tempting! ), dining here during Restaurant Week is a good deal (for comparison, their five-course tasting menu would've costed $85). 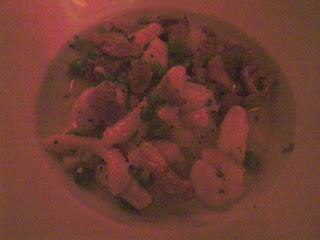 which was a nice little dish of pasta, shrimp, peas and chanterelle mushrooms in a garlicky cream sauce. I was thinking "creamier, fancier shrimp scampi with pasta" when I was eating this, and it was pretty pleasant overall, the garlic could've been a little less strong - if only for the sakes of this being a first course and I don't want to have to check my breath for the rest of the meal. My friend opted for an upgrade and got . . .
Foie Gras with Winter Fruit Clafoutis & Sauternes Gelee, Pistachio Compote (below the foie gras) and Hemp Seed Tuile quite a mouthful on the menu and on the plate. I had a little taste of everything and I think I can sum it up with "exotic", with a myriad of aromas & tastes that's hard to describe ("It tastes kinda like . . ."), though perhaps that may mean I need to polish & refine my palate some more. Overall, the dish was sweeter & fruitier than I expected ~ since those elements were present in all the non-foie gras components of this dish. 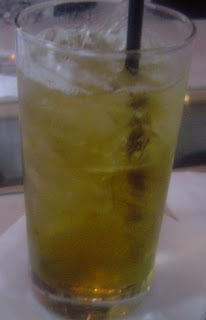 As for the fattened liver itself, good - but I've had better. For me, the spaetzle and the brussel sprouts were the highlights of the entree, both having that divine roasted, caramelization aromas that went wonderfully with the violet mustard sauce. The boar itself was not as successful; it was too gamey for my preference and had an unexpected minty-sagey aroma that I just didn't care for. But hey, at least now I can cross "wild boar" off the list of meats I've eaten -- though if they all taste like this I probably wouldn't try again anytime soon. Cinnamon Glazed Doughnuts with Hot Chocolate and Marshmallow Foam The fried dough were well-executed (crispy, fairly light with a mildly sweet and authentically cinnamony glaze) though I recall having much better doughnuts on their doughnut nights; understandable since they're pretty much mass-producing these doughnuts for Restaurant Week. The hot chocolate was also pretty good (way better with the marshmallow foam stirred in! ), but would've been more awesome if it came out hot and not lukewarm. Based on this meal alone, Grace wounds up on my list as one of those places I had a high expectation of, but wounds up falling considerably short. Part of that may been no fault of the restaurant (maybe I'm just not a wild boar person) but there were other shortcomings that were (and any who've drank room temperature "hot" cocoa before knows what I'm talking about.) But outside of DineLA, I've have had wonderful experiences here so really hoping that this is just a fluke of mediocrity. I guess time will tell when I return for an actual meal here. 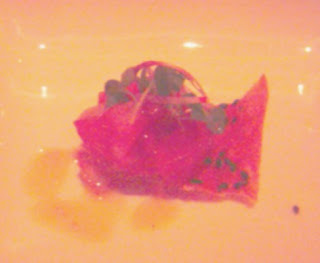 And since it's one of the big stars of the DineLA set, of course there were other food blogger reviews. Here's what they have to say. 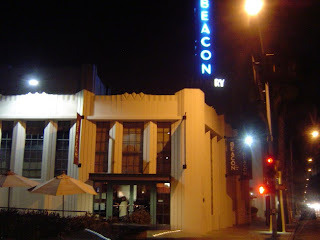 Ahh... Beacon - a place I've been meaning to checking out, and finally did - with a little incentive from DineLA. When my dining companion and I arrived for a late dinner last week (~8:15p), it was still a full house. Hopefully that's good news about the food. Like the other new restaurants of revitalized downtown Culver City area, the atmosphere and vibe of this Asian Fusion restaurant is pretty swank without going overboard with the kitsch (i.e. no oversized Buddha statues or giant sake barrels lying about.) Anyways, here's a breakdown of our 3-course menus. For starters, my companion had a warm Carrot Ginger Soup which was delightful for a chilly night, though not particularly distinctive from other carrot ginger soups I've tried or bought. I got the Stir-fried Mushroom Salad with Manchego Cheese and Yuzu Dressing that was truly delicious, with the little cubes of potent-yet-buttery cheese (think texture of Mozzarella or Gouda combined with pungence of Parmigiano) cutting into the tart dressing, warm, meaty mushrooms and the crisp mixed greens. One of few salads I would actually be content ordering as an entree. And speaking of entrees - I got the Grilled Thai Curry Chicken with Black Rice Risotto, which was pretty decent, though the sauce, wonderfully aromatic as it was with the smells of lemongrass and coconut, was considerably too salty. 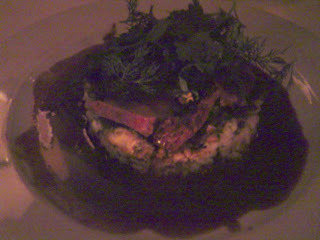 The black rice was more impressive, fluffy with a slightly nutty note. My companion got the Tasmanian Salmon Trout with Grits and Chinese Black Bean Sauce - the fish was perfectly cooked, super-moist and flavorful with a skin that's crispy as a chip. I was surprised by the combo of creamy grits & briny black bean sauce ~ nice example of "fusion done right". But overall, a pretty kickin' meal that my dining companion and I both enjoyed -- and we both look forward to returning to check out some of their other innovative fusion dishes. Finally, DineLA Restaurant Week . . . first stop, Ford's Filling Station - A modern, fusion-ish American joint in the heart of re-vitalized Culver City (also known for hotspots such as Fraiche and Beacon, the latter of which I'll also be visiting during the DineLA weeks). And a $22 three-course lunch sounds like a good deal (especially when their restaurant menu doesn't list prices - always a budgetary warning sign - and when compared to the likes of their other events, such as the gastropub lecture & dinner costing $75/person). So off we embarked. FFS' environs were pretty inviting: a mix between swank bachelor loft and a country cabin. Warm and inviting enough for a meal with friends and with enough hip factor for a date too. Anyways, we wasted no time ordering - and here's what we got for our twenty-two bones. 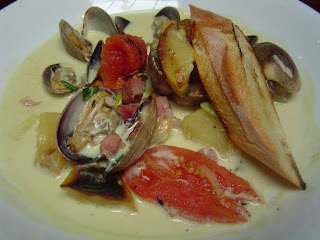 Clam Chowder with Manila Clams, Roasted Potatoes, Tomatoes, Bacon in a Creamy Leek Broth - very rich and, as you can see, chock full of the good stuff... no little, limp, rubbery pieces of mollusks here. A good and filling soup (would've been OMG amazing if it wasn't served lukewarm). It was here that service also started to falter, the five of us received our appetizers in 15 minute increments, so my friend and I started on our lukewarm soups -- not knowing it'd take another half hour before the last guy of our table is served his first course. 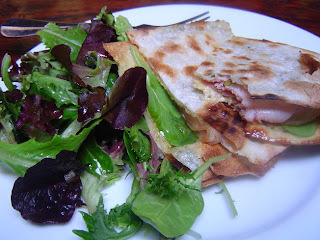 Flatbread Sandwich with Porchetta, Caramelized Onion and Fontina cheese with a side of mixed greens - Again, a solid but not-that-impressive dish. I enjoyed the crispy texture of the flatbread against the juicy, flavorful pork - but after a few bites I deemed the whole combination too greasy. The pork was very well marbled, add to the cheese and the oily-upped onions equaled a pretty queasy experience. The zippy salad with its vinaigrette dressing was kind of able to cut into the fat, but I still couldn't bring myself to finish the sandwich. 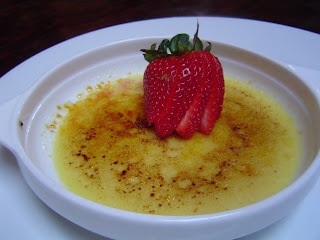 Vanilla Bean Cremé Brulee Smooth, velvety deliciousness with a perfectly burnt caramel top! 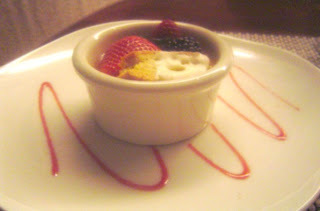 Not too sweet (which happens all too frequently with creme brulees in my experience) and I could see actual vanilla beans, always a plus. All in all, a slightly-above-OK experience. The food has the potential to be good but not quite there yet, and the service can definitely use some improvement (I observed a few neighboring tables where the serving timing looked off as well.) But I'm glad I gave it a try and at a discount.